Bob Hawley - I have been DJing for over 30 years; I was the DJ at the Skate Factory, a roller skating rink, the day it opened for 10 years located just outside of Hudson, NY. 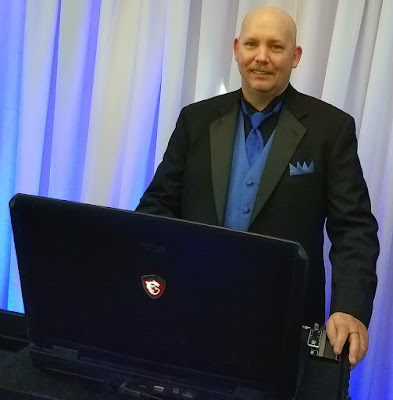 I’ve owned and operated Electric Blue DJ Service since 1997. 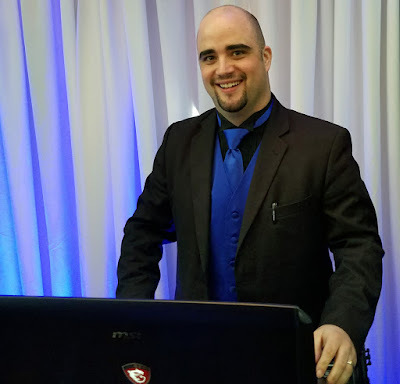 Electric Blue DJ Service has been providing music for weddings, parties, school dances, corporate events and many other events and venues with professional and very affordable services. With thousands of satisfied customers, Electric Blue DJ Service knows how to read the crowd and provide all types of music for all ages. I got into DJing years ago because I love music and I mean all music; Rock, Classical, Jazz, Country, Rap, Hip-Hop; you name it, I enjoy it all. Remember 45’s and LP’s? I used to buy tons, shortly I had a massive collection and thought more than just myself should enjoy this music as I love seeing how people react to music it’s almost electric and so began a journey to where I am now. I started playing music for family and friends at parties with Technics turntables and my home stereo equipment for nothing. Although I say “nothing” meaning no pay, what I did get, was a priceless amount of experience. I have paved my way finding out what does and doesn’t work to keep people entertained, dancing and having a great time. Now I have expanded, I still buy a ton of music in CD format and very rarely from the internet, I like the album art and something tangible that shows I actually own the music. I also subscribe to professional DJ music services only available to DJ’s and radio stations and get my music just as fast as the radio stations do. I usually own the music before it’s popular. I am now teaching other DJ’s my passion and skills for the love of music and how to make a great event ELECTRIC. Hope you get a chance to PLUG US IN…!!! Justin Cook - Joined Electric Blue DJ Service in 2014. Prior to working with Electric Blue DJ Service, Justin studied vocal music at Westminster Choir College, in Princeton, NJ and performed regularly at weddings and ceremonies throughout the Capital Region. Justin also served as the Student Activities Advisor at Schenectady County Community College and created Gravity Entertainment's Campus Underground initiative. Launched in 2010, Campus Underground revolutionized campus activities and college entertainment using the most exciting elements of Electronic Dance Music and culture. As a DJ and professional emcee Justin brings a level of professionalism and enthusiasm that keeps the party going. Aided by his experience as a musician and classically trained vocalist, Justin has a broad knowledge of music that helps build captivating playlists for any occasion. Most importantly, Justin has a keen ability to read the crowd while helping clients realize their dream event. When Justin is not DJing, Justin works as the Marketing and Parton Services Manager at the Albany Symphony and helps coordinate marketing initiatives for Electric Blue DJ Service. When asked about the most important role he plays at Electric Blue DJ Service he says "working with and serving clients as a resource. It's important that a DJ do more than simply press play." Frank Gardner - Started playing around with DJing for eBlueDJ around 1988. 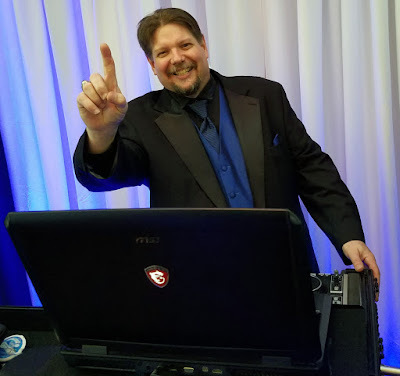 After almost a year of training, Frank DJ'd his first wedding in 1989 for eBlueDJ owner Bob Hawley and his wife Bonnie who just happens to be Frank's sister. Frank has DJ'd countless times since and has many events of all types under his belt. He's energetic and works hard at events to get people to dance where at times is difficult to do, such as Fire Department Banquets where many times guys out number women 7 to 1 and we all know the ladies are far more likely to dance than men, but Frank gets them out there and all enjoy themselves and send their praise. Frank is eager to do the same for you if hired for your event. If Frank's DJ'd an event you've attended and would like to comment, please feel free to leave a review located on our Contact Us page. I'm sure he'd love your commentary.